Abstract - In a vast country such as India using information and communication technologies in distance education mode has the potential for cost-effective in-service education of teachers. As access to the Internet is mainly available to those living in metropolitan cities promotion of its use for education has become a cause of concern for it can only exacerbate the digital divide. The Direct Media Service of the WorldSpace has emerged, as a technology that can bridge the digital divide as it is direct-to-home and uses wireless satellite transmission for delivering multimedia data and voice and can be effectively used for in-service education. In this paper experience of a pilot experiment on in-service education of physics teachers using the Direct Media Service of the WorldSpace in combination with different modes of voice delivery such as satellite radio, FM transmission and the Internet have been described. For the experiment a set of lessons on the Newton's laws of motion and the Newton's bucket experiment were developed as multimedia slides and their transition was synchronised with the audio track of the voice of the expert. The experiments on inset were carried out at New Delhi and Banglore. About seventy secondary school physics teachers took part in the different experiments described in the paper. Using the software LearnLinc a highly interactive e-leaning environment was created. The analysis of the feedback given by the participants has shown that the instructional objectives were successfully achieved. For arranging interaction of the participants with the expert phone-in and the Internet were tried. Till such time access to the Internet becomes more widespread participants may have to use telephone and/or post for interacting with experts. 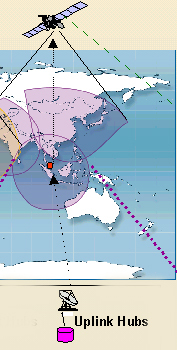 The footprint of the Direct Media Service beam is more than 14 million square kilometres. The success of the experiment has brought out the possibility of making available quality lessons given by experts throughout the country without requiring use of telephone lines for accessing them from the Internet or their dissemination through CD-ROMs. Some recent developments in information and communication technologies (ICT) have emerged as viable alternatives that can be effectively used in bridging the digital divide and for delivering learning resources at near zero cost to learners across an entire continent. One such technology that has recently emerged on the scene is the satellite radio services. The satellite radio system combines digital audio and digital data transmission (Direct Media Service), two of the most powerful technologies of the Information Age, in the direct-to-home (DTH) mode. The WorldSpace Radio employs satellite technologies of transmission and geographic reach with a footprint of 14 million square kilometres. That is all users within this area can receive digital sound and digital data with a 10 cm wide satellite antenna. The WorldSpace offers Direct Media Service (DMS), a unique facility of delivering huge amounts of web enabled data to a user's PC by transmission from a satellite. The user's PC is connected to a WorldSpace digital receiver coupled with a PC Adapter or is provided with a PC Receiver Card. Data is loaded directly in the hard drive of the user's Pentium-class PC, without the need for a telephone line or connection to an Internet Service Provider. DMS is a one-way broadcast system and is not an interactive Internet system. DMS supplements traditional Internet services by offering delivery of gigabytes of popular, educational and informative web-style content without "per-minute" telephone line charges. It is like getting a CD-ROM filled with web content, delivered right to your PC every day. Regarding the speed of delivery of data, the download rate can be as high as 128 kbps. The download occurs automatically and that too unattended, while user may be at work or otherwise engaged. Access to cached content, therefore, seems virtually instantaneous, like a high-speed connection or a CD-ROM. Combining DMS with terrestrial Radio broadcast opens up yet another possibility for distance education. FM broadcast is an alternative voice delivery mode. It has an advantage over the satellite radio as it can be used for arranging interaction of listeners located within the range of the broadcast station with experts through phone-in facility. Slides to be viewed with audio broadcast may be delivered to users as hardcopies or on CD-ROM or could be accessed from Internet Web Page. Yet another option for accessing sound files is from the Internet, as compressed sound files of high audio quality can be easily accessed through the Internet using the MP3 technology. As mentioned in the preceding paragraph the slides to be viewed can also be accessed from Internet Web Page. With the synchronisation of audio tracks with slides, which can be easily arranged, multimedia files can be viewed through Web Browser software such as the 'Internet Explorer or as a slide show using the 'Microsoft Power Point' type of software. The audio/text conferencing facility of the Internet has emerged as an effective mode for arranging interaction among a large number of persons sharing common interests. Another method of delivering multimedia lesson can be through special purpose software product that connects many users to network their systems with that of the teacher through a centralised Internet server system. Various technology options described briefly in the preceding paragraphs can be used for teaching in synchronous and asynchronous modes with traditional supports like emulated electronic board etc. The National Council for Teacher Education (NCTE) recently carried out experiments on in-service education of physics teachers by using various combinations of the ICT mentioned in the preceding paragraphs. The experiment was a collaborative effort of several organisations. The principal organisations that participated in these experiments were the Indira Gandhi National Open University (IGNOU), UNESCO (made available partial fund support for meeting the transmission costs and for research), WorldSpace Asia (India) and the Satyam Infoway. In this context it may be of interest to those engaged in distance education to know of the various steps involved in carrying out this experiment. These steps were: the development of the multimedia courseware, use of different delivery modes such as data casting using satellite radio and the Internet, broadcast of sound track by using satellite radio and independently through FM transmission, and feedback of the target group for finding the effectiveness of the various approaches and for its improvement. voice recording of the lesson delivered by the expert, editing of the sound file, preparation of multimedia Power Point slides using the notes of the expert, checking of the content accuracy of the slides by the expert and synchronisation of the sound file with the slide show. The sound files and the data files were then sent to the WorldSpace transmission hubs at Singapore and Melbourne and were also posted on a Web site for asynchronous downloading and use. In the Table 1 various modes of delivery that can be used in distance education and tried out in this experiment have been given. The expert for this experiment was A. N. Maheshwari, a physicist and a teacher educator. The target group for this experiment was secondary school physics teachers. For this experiment two lessons in physics were used, one was on teaching of the Newton's laws of motion and the other was on the Newton's bucket experiment for explaining concepts of absolute space, inertial and non-inertial frames of reference. Teaching of the Newton's laws of motion is universally found difficult by teachers because students come with their common-sense explanations of physical phenomena and find concepts such as force, acceleration and application of laws of motion difficult to comprehend. The lessons were developed by taking up a set of questions from elementary mechanics and answering them by identifying forces using free-body-diagram, highlighting the correct application of the laws of motion and pointing out the care required in using the third law of motion and the second law of motion. The lesson was recorded on 3rd November 2001 in the studio of the Educational Media and Production Centre (EMPC), IGNOU, and converted into an audio CD. The audio CD was edited and converted into audio files suitable for broadcast by satellite radio and/or FM, and for download using the Internet. Using the notes of the teacher a storyboard was drawn up for preparing the slides for the lesson. The slides were supported with graphics, animation, text and mathematical equations and were designed and made by Krishna Moorthy, a software expert, who also played the role of co-ordinator for the experiment, as participation of several agencies was involved. The slide transition was timed for synchronisation with the audio track. In consultation with the content expert of the lesson the data files and the audio files were finalised and delivered to the WorldSpace for data casting and broadcast. The first experiment was carried out on 27th November 2001 at the EMPC. The data files were delivered to a computer in the EMPC provided with a PC Adapter and connected to a satellite radio antenna. The WorldSpace broadcast the sound at 2 p.m. and the programme was viewed by a select group of audience comprising of educationists, teacher educators, science communicators, heads of schools, physics teachers and the faculty of the IGNOU. The audience interacted with A. N. Maheshwari after the lesson. The second experiment was carried out at Banglore on 28th November at the Regional Centre, IGNOU. About 25 physics teachers from schools in Banglore attended the lesson. The participants saw the slide show on a screen. A LCD projector was used for the slide show by activating the data file from a computer. The Banglore Station of the All India Radio on Gyanvani, the FM channel of the IGNOU, broadcast the sound track. After the lesson was over the participant teachers interacted with the expert using the phone-in. The participants were requested to fill-in the tool questionnaire for knowing the usefulness of the approach for in-service education. The third experiment was carried out on 29th November at the Banglore Centre of the Satyam Infoway. The 34 physics teachers who took part in this experiment were divided into two groups. One group attended an online virtual class taken by the expert using the software LearnLinc. The other group received the lesson delivered by live demonstration of data casting using the satellite from the up-link hub at Melbourne and broadcast of the sound track from the up-link hub of the WorldSpace at Singapore. All the participant teachers filled the questionnaire and then interacted with the content expert, software expert and the experts of the Satyam Infoway, which is one of the leading Internet service providers. The feedback of the participants has been analysed. It would suffice to mention that 96% of the participants of the programme held on 28th November (Gyanvani FM transmission) and 100% of the participants of the programme held on 29th November (DMS and interactive virtual classroom) have responded that the objectives of the teaching were attained. Seventy six percent of the participants have suggested that other topics may also be covered using the approach. Sixty seven percent of the participants found sound received at their workstations from the WorldSpace to be of high quality and 23% rated it to be adequate. The quality of sound delivered by FM broadcast was found to be adequate by 52% and 28% rated it to be of poor quality. This was perhaps due to poor signal and can be easily improved by using outdoor antenna. Eighty percent of participants found communication of ideas being discussed in the lesson good and clear. On the whole it can be concluded that the experiment was successful in meeting its objectives. The success of the experiment (see survey results) in achieving the targeted outcomes have opened the possibility of delivering multimedia learning resources by different techniques (see Table 2) to learners directly at their homes, without requiring telephone connections or incurring substantial recurring expenses. The approach used in the pilot experiment has far reaching implications in meeting the goal of providing quality learning resources at an affordable cost by tailor-making them for meeting the varying needs of the entire spectrum of education spanning from school education to professional education. The experience of this pilot experiment on distance education using the WorldSpace system has brought out that it offers itself as a cost-effective technology for delivering quality lessons across the country. The cost of delivery to one user is the same as that of delivering it say to million users. What needs to be done is to identify good teachers from across the country and producing courseware using their expertise. It may not be necessary to bring them to a studio for recording of their lessons. Using cordless microphone recording of their teaching can be done live from their classrooms. By taking pictures of the blackboard work using digital camera and noting time of pictures taken during the progress of the lesson, work of synchronisation of the sound track with the visuals can be carried out without putting inordinate demand on the time of the expert. This approach can be used for distance education of students as well as for in-service education of teachers. For making it viable what is required is sharing of the cost of the transponder by national organisations functioning at different levels of education. The cost of the digital radio receivers will also come down with the increase in its demand. As has already been mentioned, the satellite digital radio offers itself in bridging the digital divide as it is direct-to-home and its bandwidth is adequate for carrying CD quality sound and wireless delivery of data. The challenge is to utilise it by integrating it with other information and communication technologies such as the Internet not only for asynchronous use but more for synchronous interaction of the learners with experts. The courseware can be repackaged on CD-ROM for offline use. He is a theoretical physicist by training and has a rich experience of teacher education. He carried out the first experiment in India of inset of primary teachers using one-way video and two-way audio teleconferencing. He has been promoting use of information and communication technologies in pre-service and in-service education of teachers. He has held senior positions in educational administration, such as the Principal, Regional College of Education, Mysore; Vice-chancellor, Cochin University of Science and Technology; Joint Director, National Council of Educational Research and Training. As the Chairperson of the National Council for Teacher Education he is responsible for regulating standards of pre-service teacher education in India. He has 4 decades of experience mainly in the area of software projects both for domestic market and for international customers located around the globe. The area of applications included System software, Mathematical software and Media software for large computer manufacturers, government agencies and educational institution. He has been involved in UNESCO projects from mid 80s. He has undergone courses in physics at graduate level, applied mathematics at postgraduate level and various professional courses conducted by large computer corporations like IBM and Honeywell Bull.